Струмилин соглашается, что энергия в угле в 45 раз дешевле чем в сливочном масле (потребляемом человеком для труда), и энергия в нефти в 110 раз дешевле чем в сливочном масле. По сути, Струмилин природную ренту приписал непроизводительному труду, а рента вообще не фигурирует в его схеме. В действительности, большая часть природной ренты действительно расходуется на оплату непроизводительного труда, прежде всего на оплату труда всех бюджетников, но в физическом смысле процесс идет в противоположную сторону по сравнению со схемой Струмилина. Бюджетники потребляют стоимость природной ренты, а не производят ее, и фокус Струмилина удается только потому, что он природную ренту вообще не учитывает с самого начала. Главный порок схемы Струмилина всплывает только тогда когда появляется необходимость экспортировать энергоносители, которые при Сталине не экспортировали. Если «природные ресурсы ничего не стоят», то в соцстраны их надо продавать за копейки, так же как гравий и песок, или как минеральную воду в случае с нефтью. При экспорте в капстраны по рыночным ценам будет возникать чудовищная прибыль, которую либо надо отдавать рабочим нефтянникам, либо надо признавать, что СССР чудовищным образом эксплуатирует нефтянников. То есть, теория Струмилина, хоть через задницу, но могла работать в рамках замкнутой экономики, но при начале внешней торговли она просто взрывалась от порождаемого бреда. 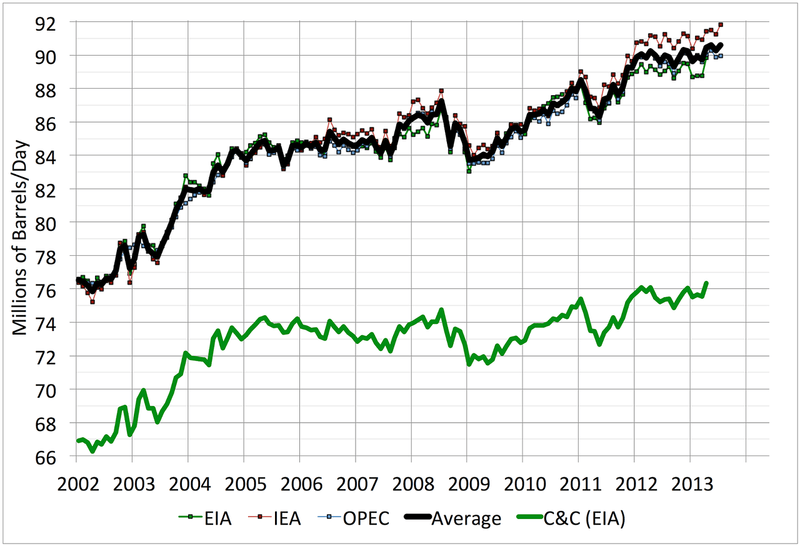 That chart also includes the EIA’s figures for crude and condensate (C&C), a narrower definition of oil that excludes biofuels and natural gas liquids that are debatable as to whether or not one wants to consider them in oil supply trends. 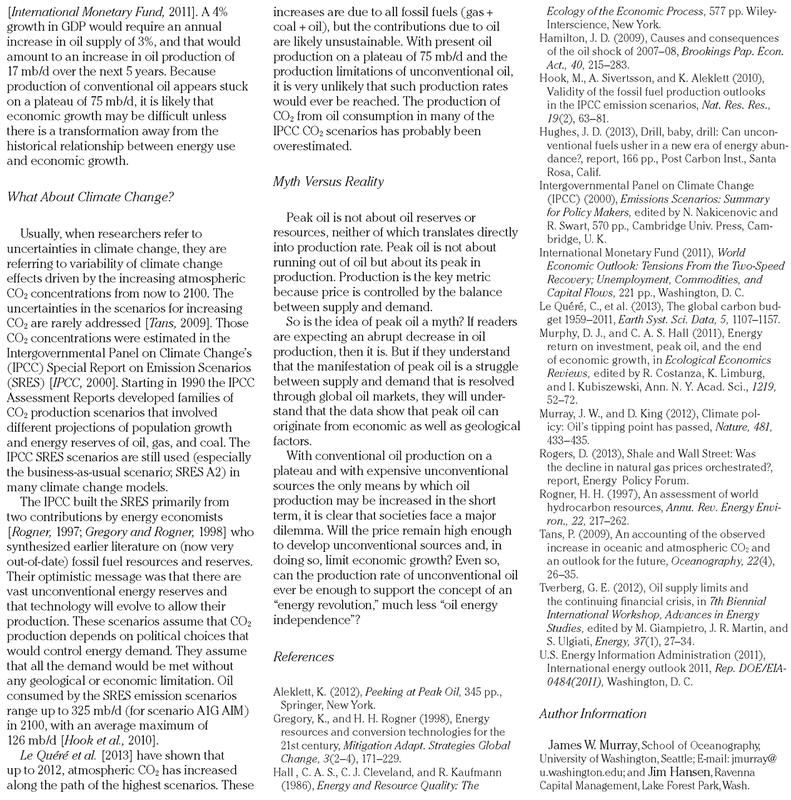 Global C&C production has been almost flat since 2005 — a bumpy plateau that slopes only very slightly upward. picture shows the various oil production series, together with Brent oil prices (inflation adjusted, on the right scale). 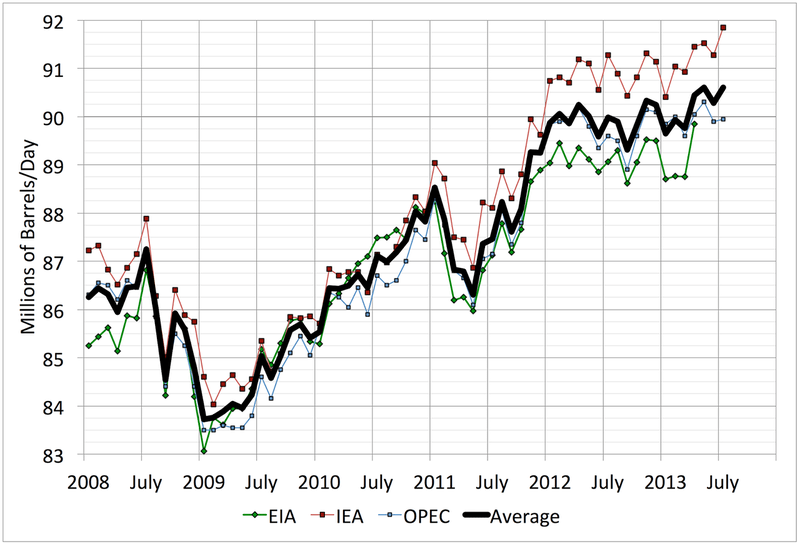 This is based on EIA data for all-liquids through October 2012.
earlywarn: US Oil Rig Boom Leveling Off? Европейское нефтяное эмбарго лишь одна из мер, предпринятых против Ирана. В пакет входят также санкции в банковской сфере, которые уже отрезали Иран от мирового финансового рынка, заставив иранские финансовые структуры обратиться к затратным и не всегда легальным схемам проведения международных торговых и валютных операций. Другой не менее чувствительный для иранской экономики акт – запрет на страхование танкеров с иранской нефтью. The EIA helpfully produces a breakdown of the global liquid fuel supply into components. 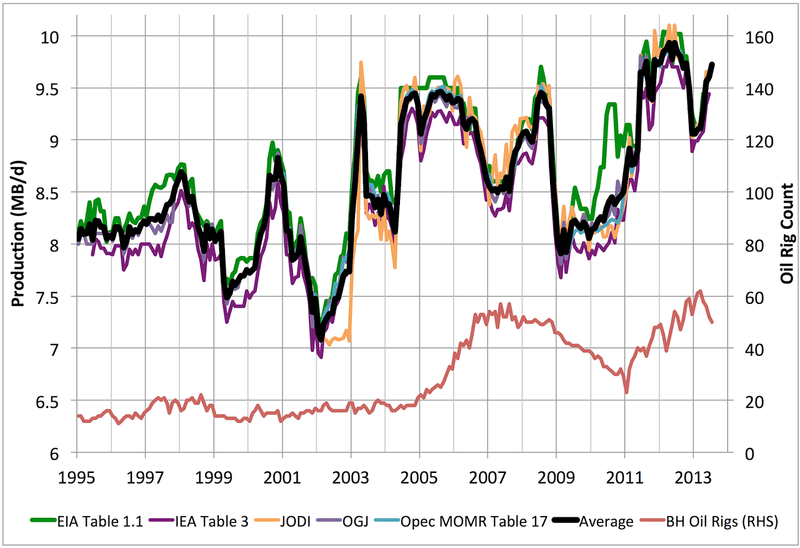 This allows us to distinguish change in the supply of «oil» — narrowly defined as crude oil plus condensates (hydrocarbons which come out of the ground as liquid) — from changes in other things (natural gas «liquids», most of which are actually gases like ethane, propane, and butane, ethanol, and refinery volume changes. The above graph shows these four substreams — the crude and condensate (C&C) is on the right scale and the others on the left scale. This approach is designed to make it easiest to compare changes. The interesting news is that crude+ condensate, which has been pretty much plateaued since late 2004, has now made new highs. So clearly «peak monthly oil» is not behind us. Above, I show the price of Saudi Arabian Light grade from the beginning of 2000 (on the y-axis) versus either Brent or WTI on the x-axis. Historically, Arab Light has always sold at a slight and only moderately variable discount to Brent/WTI (because Arab Light is more sour). The black line above represents exactly equal prices. However, in recent months, the historical relationship with WTI has completely broken down and Arab Light is selling for much more than WTI. The relationship to Brent is unchanged. you can see that the correlation with Brent is a bit tighter and in particular the current anomaly in the WTI graph where gas prices are too high relative to WTI (the «loose end of the string» at about ($80, $3.50)) is non-existent in the Brent graph where current prices are pretty much normal. WTI is now reflecting an anomalous situation in the US midwest and no longer even explains US gas prices well, let alone global trends. What are the possible explanations for that? 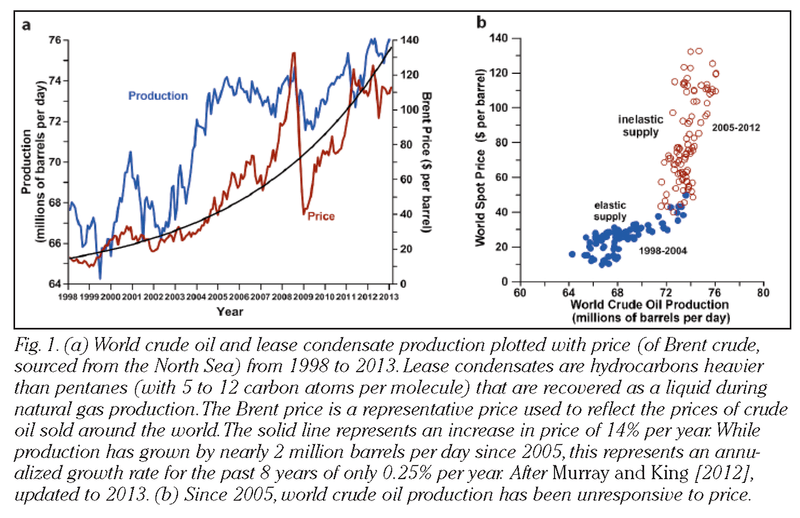 1) Peak oil plateau — within the areas available to the IOC’s, the geology simply will not support higher extraction rates. 2) Over-regulation — they are not being allowed to drill in places that could support higher extraction rates. 3) Under-investment — the IOC’s have failed to invest in exploration, development, extraction, and extended recovery techniques that would support higher rates. 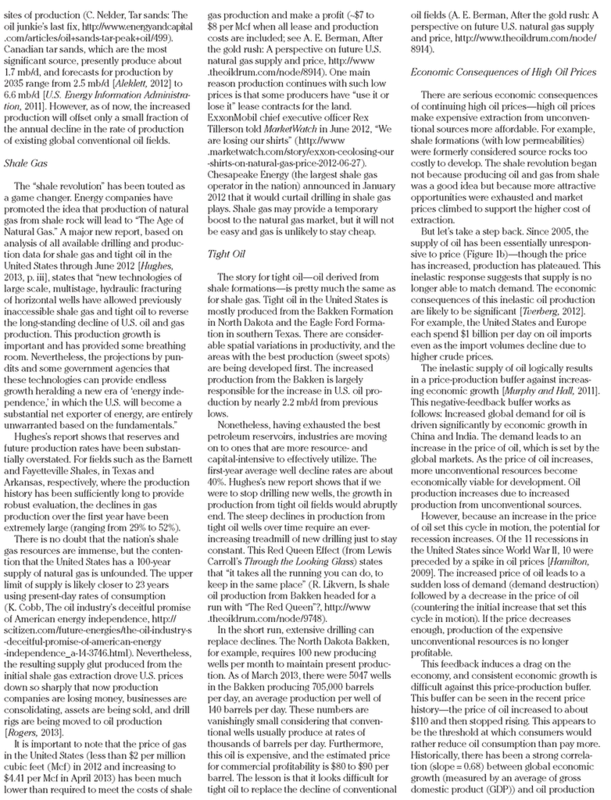 4) Short term greed — they are more interested in profits today than in increasing extraction rates. (corollary — they don’t think they can increase extraction rates so they might as well minimize costs and maximize profits). A reader asks to see a graph of global oil supply per capita — here it is. The global population data are from the US census bureau, and the oil supply data are from ASPO through 1979 and EIA total liquids after that (the two sources agree to within a percent or so in the overlap). Following up on yesterday’s post of global oil production per capita, the above graph shows oil consumption per capita for an illustrative selection of countries around the world (along with the world line in black for comparison). You can see that the developed countries all had peak consumption in the 1970s, fell in the early 1980s, then were flat for a while and began declining again. In Europe, that second decline began in the mid 90s and has been gradual. In the US it started in 2005 and has been rather abrupt. 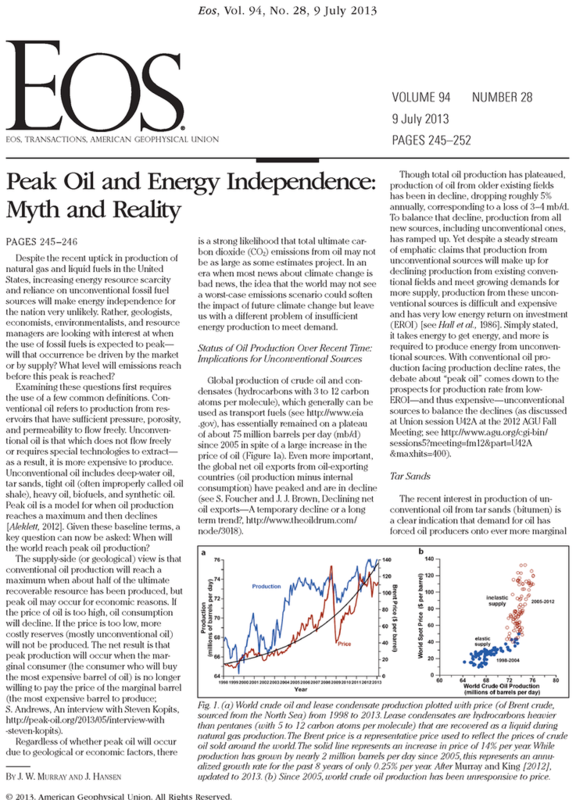 The per capita consumption of oil and total primary energy were calculated for the world using data derived from the BP Statistical Review of World Energy (Web: http://www.bp.com) and the CIA World Factbook. (Web: http://www.cia.gov/publications/the-world-factbook/index.htm). The average value for the 27 years inclusive from 1983-2009 was 4.54 bbl/P/Y with a standard deviation of 0.10 bbl/P/Y. The above graph shows US weekly petroleum products supplied (EIA) along with a nine week centered moving average to try to smooth out the noise a bit. Data begin in 2000 and go through the week of July 1st 2011. 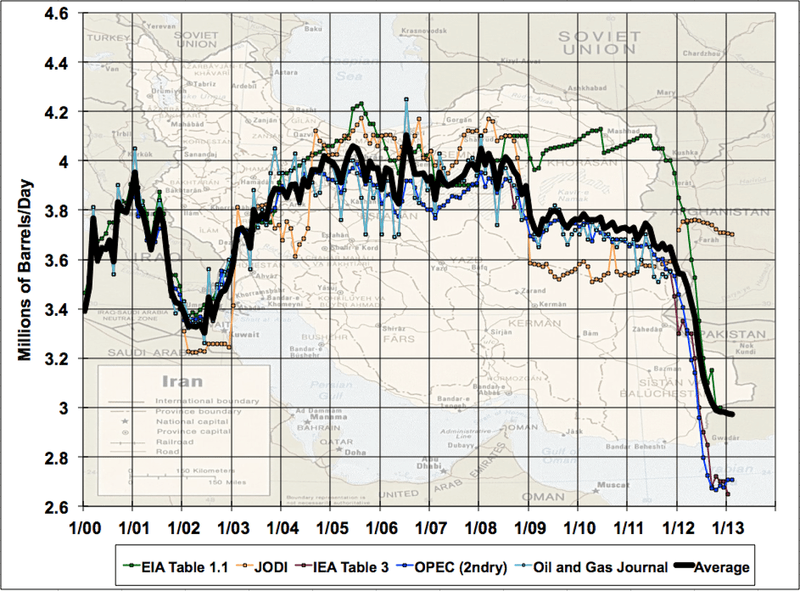 You can see that the high prices since the beginning of 2011 were causing a contraction in oil consumed. As I write, WTI oil prices are down to $75/barrel. 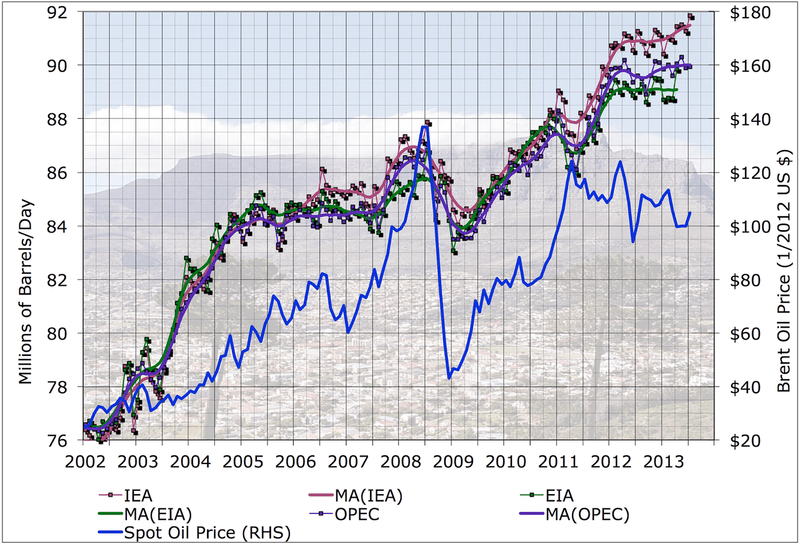 The above graph shows the historical relationship between US average retail gasoline prices and WTI spot prices. The vertical orange line is the $75 level the market touched today. As you can see, historically this corresponded to gas prices of $2.50-$3/gallon. According to OPEC, Saudi Arabian production increased to 9.75mbd in July. This is a modern record (though they produced more back in the 1980-1981 timeframe). However, they didn’t achieve the 10mbd that press reports were suggesting back in June. Whether because the press had the target wrong, or because they couldn’t quite manage the goal, we are left to speculate. The increase from May to July is about 800 or 900kbd — still some way short of making up for the loss of Libyan production.